PLEASE REGISTER WITH YOUR INDIVIDUAL PERSONAL EMAIL ADDRESS. YOU CANNOT SHARE EMAIL ADDRESSES ON THE AMERICAN HEART ASSOCIATION WEBSITE. Please select a course from the options below. We can also schedule a class at your location, better suited to your businesses needs! Please click here for more information about this! WHEN COMPLETING THIS PROCESS IT REQUIRES YOU TO INPUT YOUR ADDRESS ** PLEASE MAKE SURE THE ADDRESS SUBMITTED IS THE BILLING ADDRESS ASSOCIATED WITH THE CARD USED FOR PAYMENT** Otherwise your payment will not be successfully processed. Please look in your Spam or Junk email box. All confirmation emails are automatically generated and sent to you. Thank you! See you in class! All cancellation notices must be sent by email to info@heartstartcpr.net. Phone messages will not be accepted as cancellations. Purchased and received books will not be refunded. You will receive a full refund for the purchase price of the course if you cancel more than 14 days prior to the date of the course. You will receive a 50% refund of the purchase price of the course if you cancel between 8 to 13 days prior to the date of the course. There will be no refunds for cancellations less than 7 days prior to the date of the course. We cannot refund for eLearning keycodes/URLs that are assigned to you. If you wish to cancel that type of course (within the timeline above) you may submit a request to receive a partial refund. We are sorry for any inconvenience this may cause. If you would like to reschedule your class (at no additional cost) to another date, please email us. If you have any questions or concerns please email us at info@heartstartcpr.net. This package saves you approximately 18% on each course! This package is valid for an entire year from the date of purchase. The Silver Package is valid on the courses above and does not include the price of textbooks. Online ACLS, PALS or BLS classes are not available with packages. All training packages are non-transferable and must be used within a year of purchase. The BLS for Healthcare Providers course is designed to provide a wide variety of certified or noncertified, licensed or nonlicensed, healthcare professionals with the skills to keep people alive until they can be brought to a hospital or be treated with more advanced lifesaving measures. Students must pass a written exam and skills test in order to qualify for a BLS for Healthcare Provider Course Completion Card. 2015 AHA book is mandatory. Please bring your book or choose to purchase one. 2015 AHA book is mandatory. Please bring your book or choose to purchase one. Please choose to have it shipped to you for a nominal fee. PLEASE NOTE: IF YOU NEED TO CANCEL YOUR SKILLS CHECK, YOU CANNOT BE REFUNDED FOR THE ONLINE COURSE KEYCODE. ONCE THAT IS ASSIGNED TO YOU, IT CANNOT BE ASSIGNED TO SOMEONE ELSE. Skills sessions only scheduled at San Ramon Location. BLS for Healthcare Providers Online is a fast, official American Heart Association (AHA) Self-Directed Comprehensive online cpr course which allows students to take the Basic Life Support for Healthcare Providers (CPR) course on a computer, instead of attending a traditional, classroom based course using simulation technology and scenario-based learning. Duration: 1-2 hours online + 45 minute skills session at training center. This online healthcare provider cpr training program also includes the complete textbook online, so there is no need to purchase that separately. This is state of the art. It is a very fun way to do your skills testing and computers make sure that you are doing compressions and breathing exactly right. This is AHA accredited and you will receive the same Course Completion Card after completing your skills as you would from taking a traditional class. Please bring your Online Course Completion Certificate to the Skills Check. NEW 2015 EDITION OF THE ACLS PROVIDER BOOK IS HERE. The AHA has made it mandatory for you to have a Provider Manual with you during class. You will not be able to take the class without a book. If you need to, you may purchase a book from us during registration and have the opportunity to have it shipped to you for a small fee. 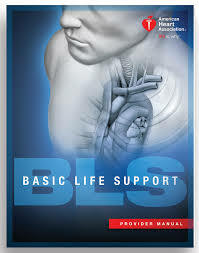 AHA BLS Certification is NOT included with ACLS. If you need to recertify for BLS you will have the opportunity to add on the eLearning Online BLS with Hands On Skills Check during registration. Use the password ACLS15 to access the videos and self-assessment test. To be successful in any ACLS course, students should be able to identify ECG rhythms and should know pharmacology specific to cardiopulmonary arrest and other cardiopulmonary emergencies before beginning the course. It is strongly recommended that students review the ACLS course materials and complete a precourse self-assessment using the tools in their student materials before starting the course. EACH CLASS IS 2 CONSECUTIVE DAYS. Once you complete your registration you will get a registration confirmation email. If you do not see it in your inbox, please check your SPAM/JUNK/BULK email boxes. * Promo (discount) codes are not valid for eLearning online courses. An alternative to traditional, classroom-based ACLS training, HeartCode™ ACLS is a self-directed, comprehensive eLearning program from the American Heart Association. The full course combines an interactive, cognitive portion completed online, with CPR skills training. It includes interactive patient cases that test the user’s ability to apply the ACLS algorithms to effect treatment. Users can practice and test their skills on a Voice Assisted Manikin (VAM) or with a certified AHA ACLS Instructor. HeartCode™ ACLS includes interactive patient cases that test the student’s ability to apply the ACLS algorithms to effect treatment. HeartCode™ ACLS will provide your team the benefits of standardized ACLS instruction and improved competency. Students can earn or renew their provider card in three easy steps! 1. Complete the cognitive computer-based portion (which includes watching videos, performing simulations, and a written test). 3. Otherwise, You must perform your skills test at our training site to receive your official AHA ACLS Provider card. This continuing education activity is certified for physicians (ACCME/AMA), nurses (ANCC), pharmacists (ACPE), and EMS Practitioners (CECBEMS). Your continuing education unit hours will be available to you from the AHA website. The online course will take approximately 8-10 hours to complete. You will be at the training site for less than two hours to get your skills tested. This is an ACLS Online Course SKILLS CHECK ONLY. You must have previously completed the Heartcode E-Learning ACLS Course prior to the Skills Check off. To get your card, you must bring your Course Completion Certificate to the skills check off. Please contact FrontDesk@HeartStartCPR.net if you have any questions. American Heart Association Pediatric Advanced Life Support (PALS) Provider Initial Course. Upon completion of this PALS class the health care provider will be able to understand how to recognize and prevent the common causes of pediatric injuries and emergencies that require resuscitation. You’ll understand how to recognize respiratory failure, shock, and cardiac arrest and initiate advanced resuscitation with airway and ventilation control, vascular access, fluid and medication therapy and identify and treat rhythm disturbances. 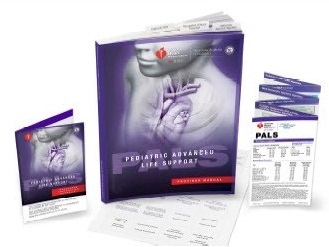 You must have a 2015 Edition of the American heart Association PALS Provider Course Manual at class. AHA BLS Certification is NOT included with PALS. If you need to recertify for BLS you will have the opportunity to add on the eLearning Online BLS with Hands On Skills Check during registration. Use the password PALS15 to access the videos and self-assessment test. THIS IS A 2 CONSECUTIVE-DAY COURSE! Recommended for: MDs, RNs, Paramedics, EMTs, and Medical Personnel with Busy Schedules. The PALS Online Class utilizes simulation technology and scenario-based learning that is self-directed on your computer at home. The course covers all of the same material as the traditional classroom based PALS class. This program also includes the complete PALS textbook online so there is no need to purchase the book separately. **The Online PALS Course is very popular for on-site group training as well. HeartStart CPR can come to your business to provide Part 2 & 3 for your staff. Call for details! You will receive your American Heart Association PALS card the same day as your skills check. CME/CE credit is provided by the American Heart Association for Physicians, P.A.s, Nurses, Pharmacists, and EMTs. Please Note: This course has been tested on Windows XP and Mac OSX, with Internet Explorer 7+ or Firefox 2+. HeartCode programs are not supported by Apple Safari. Students are allowed up to 60 days after the completion of the online part of the course to complete the skills session. Discount codes are not valid on online courses. E-Learning PALS Skills Check Off. You must have completed the AHA Heartcode e-Learning PALS Online Course prior to coming to the skills session. You must bring the completion certificate with you to receive your card at the end of the skills test. This class is designed for individuals who need a CPR card for either personal fulfillment or for work purposes. This class is perfect for the lay person, the fitness instructor, the educator, or the childcare professional. This class is also appropriate for parents, couples ready to adopt, expectant parents, or anyone else. Total cost of class is $325. $50 deposit now and remaining $275 paid to the instructor the first day of class by cash or check. Description: This course provides a deeper understanding of fire investigation and builds on Fire Investigation 1A. Topics include the juvenile fire setter, report writing, evidence preservation and collection, interview techniques, motives, and fire fatalities. Total cost of class is $285. After $50 deposit, remaining balance of $235 due at class to the instructor by cash or check. Description: This course provides information on general administrative functions and the implementation of department policies and procedures. Addresses the fire department's role, image, and mission to the public. Standard: Complete all activities and formative tests. Complete all summative tests with a minimum score of 80%. Description: This course provides information on conducting incident size-up, developing and implementing an initial plan of action involving single and multiunit operations for various types of emergency incidents to mitigate the situation following agency safety procedures, conducting preincident planning, and develop and conduct a post-incident analysis. Total cost of class is $325. After $50 deposit, remaining balnce of $275 is due at class to the instructor by cash or check. Description: This course provides information on the use of human resources to accomplish assignments, evaluating member performance, supervising personnel, and integrating health and safety plans, policies, and procedures into daily activities as well as the emergency scene.